Before going on vacation, I baked an apple pie recipe from The Pioneer Woman that I’ve always wanted to try. My excuse? I had a pile of apples from my mom’s Fuji apple tree. Actually, it used to be my tree… when I still lived at home. Now, normally for baking recipes, the Fuji apple is not what I would choose. The ones you get from the store tend to be too sweet and don’t hold their shape very well. So typically I would bake pies and crisps using Granny Smith or Pippin. 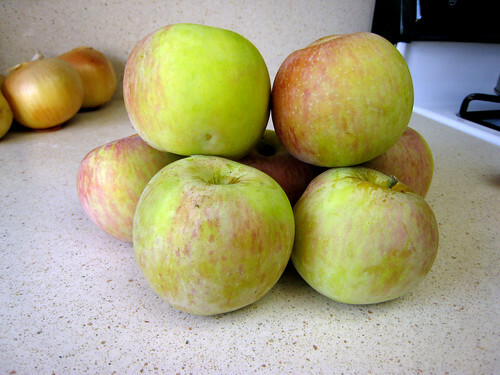 But the Fuji apples from my mom’s tree happen to be a little bit more tart than the ones from the store. They work pretty well in baking recipes! For this pie, I used a store-bought Pillsbury crust. 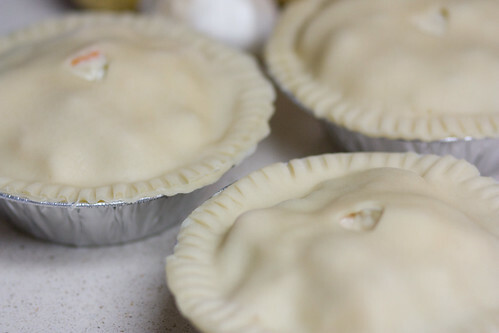 I do have some homemade pie crust dough in my freezer… but I’m saving those for later in the season when I want to make a 2-crust pie or another chicken pot pie. One of my biggest pet peeves about apple pie is CRUNCHY APPLES. I HATE CRUNCHY APPLES IN MY PIE! 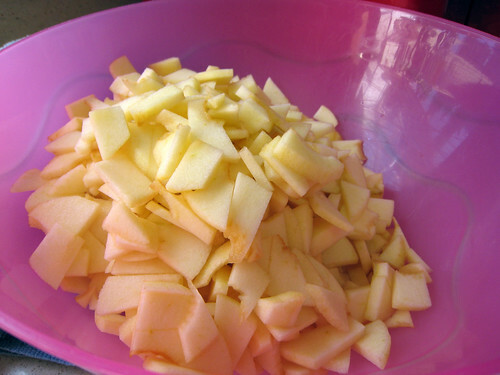 I prefer them to be tender…and therefore I chop my apples pretty thin. Whoops I skipped a few steps on the photos! I mixed sugar, flour, and cinnamon into the chopped apples. Cinnamon was not in the original recipe… but I just can’t do apple desserts without cinnamon! I also mixed some cinnamon into the crumb topping. I LOVE CINNAMON! Before putting the pie in the oven, I covered the crust edges with some foil, which I later removed about halfway through baking. This was to keep the edges from getting overly browned before the inside of the pie had a chance to fully cook. Also, I ended up needing to bake this much longer than the recipe states (I’d say a good 20 minutes longer). This may have been partly my fault, for placing the pie pan on a cookie sheet (to catch the drippings), instead of directly on the oven rack. I also used less caramel topping than the recipe called for. I don’t know… I was too afraid to drown it in sauce. 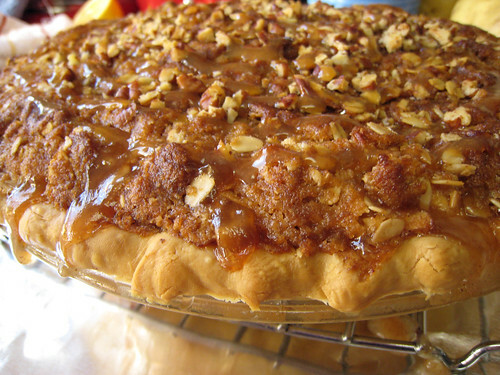 I’d never had apple pie with caramel topping on it before. But after I tasted this pie, I decided to go ahead and use the full amount from now on. It was so good! 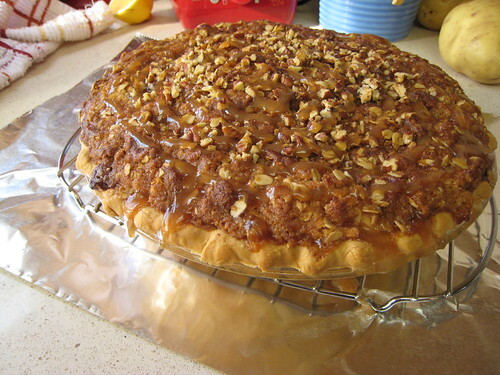 I also didn’t use as many pecans on the top as the recipe called for. 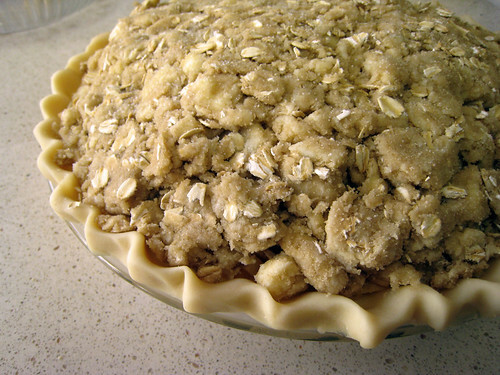 But that was only because my pie was pretty rounded on top and most of the nuts would just roll right off when I tried to sprinkle them on! One thing Jason and I both really loved about this pie was that you could taste the slight saltiness in the topping. What? Salty apple pie?? Trust me, that 1/4 tsp of salt really took it up a notch. I have to confess that I made this pie a second time a couple weeks later, for a family dinner. And I bought a fancy red pie pan with scalloped edges just for the event. I thought my plain glass Pyrex pan was too boring. Well, sadly my pie did not cook all the way through in that new pie pan. This time I had placed it directly on the rack… but the dish was much deeper than my usual pie pan… so the bottom crust and the apples on the bottom layer didn’t cook all the way through. So sad. 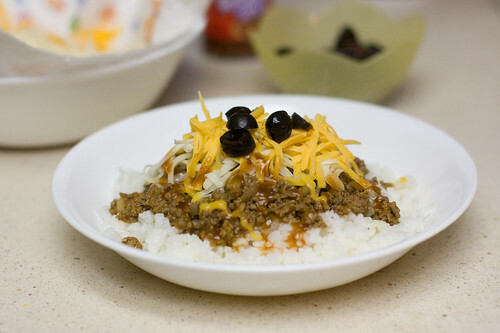 I hate when I mess up in the kitchen… especially when I’m serving something to other people! But everyone said it was delicious anyway. And it was, if you only ate the top half. 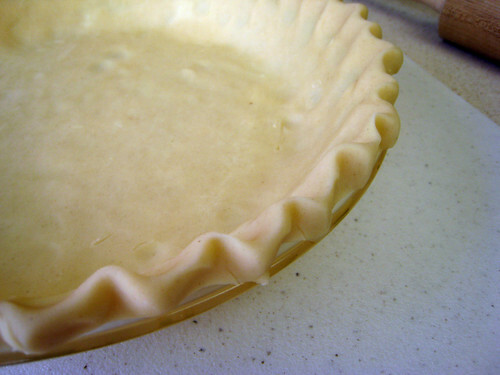 That’s one of the benefits of the plain glass pie pan… you can lift it up and check the bottom crust for doneness. Couldn’t do that with my new red pan! Well, I sure did abandon this blog, didn’t I? It’s just that… I’ve been trying to focus on losing weight since before the holidays, and food blogging just isn’t that much fun when one is watching their calorie intake. 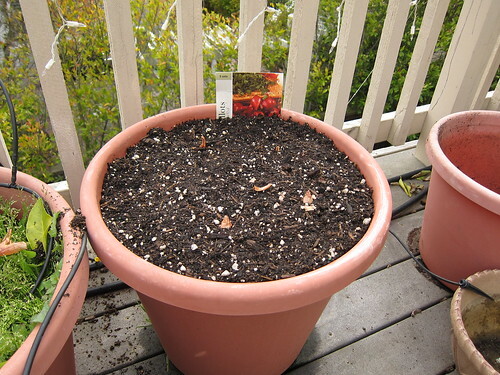 The good news is, this is also a gardening blog… and gardening season is finally here! Well technically, this is California and gardening season is year-round. 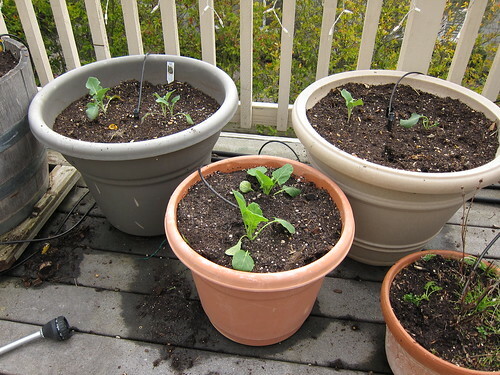 There are many vegetable plants that you can grow during the colder months. This Sunday Jason and I got started on our 2010 veggie crop. Even though it was January 31, we were a little bit behind schedule for some of these veggies… but I think they’ll do reasonably well. 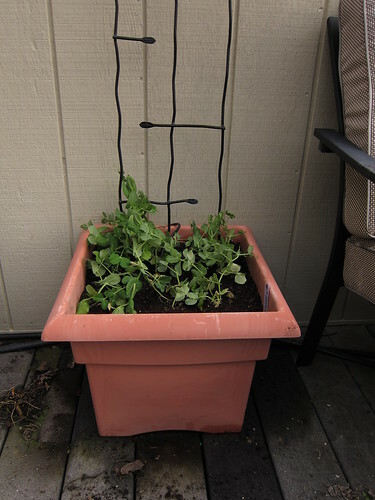 I looked at my calendar from last year and found that we put peas and broccoli plants in the ground on February 1. And both of those did very well! Shelling peas. These nursery plants were a little bit leggy and scraggly looking… but since we were late to the game, this was the best we could do. I am crossing my fingers that they will recover and grow up to be big and healthy. 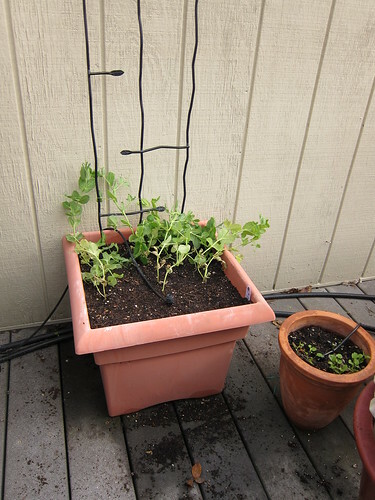 Here is the second pot of peas (you can see how scraggly around the base of each plant in this photo). The small pot to the right was a pleasant surprise. I had cilantro growing in there last spring/summer, and it went to seed and the seeds have sprouted! Yay for volunteer cilantro plants! I always get a kick out of finding volunteer flowers and other plants around my garden. Sometimes I pull them up, sometimes I try to transplant them, and some I just leave where they are, such as this cilantro (Cilantro doesn’t transplant well anyway, by the way. It has a long taproot.). Next up we have some brussels sprouts. I am NOT a fan. Jason picked these out. 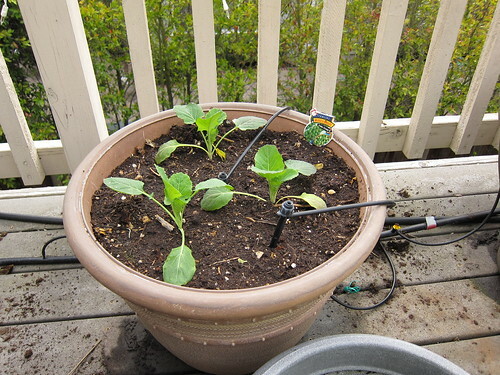 But you know, I’ve never liked vegetables much in general… until I started gardening. Slowly I’ve acquired a taste for many veggies through gardening, like green beans, summer squash and broccoli. So who knows. Maybe this year I will decide I like brussels sprouts too. I’m not sure what these are… either more brussels sprouts, or broccoli. I guess they are related so the plants look really similar when they’re small. And here is Jason’s onion patch. 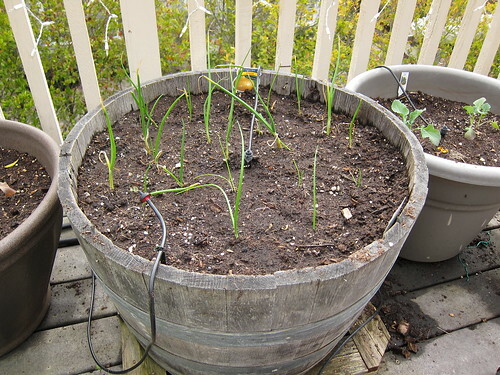 Last year we planted Walla Walla onions in this pot and had great success. This year we have learned that you need to separate each little onion stalk to give the bulbs room to form (we were onion newbies last year). So we have spanish yellow onions here, along with about 3 or 4 volunteer Walla Walla onions that sprouted up from last year’s seeds! They were actually sprinkled between a few different pots, but Jason carefully transplanted them into the barrel. The pot on the left is broccoli (I know for sure because the label is showing!). 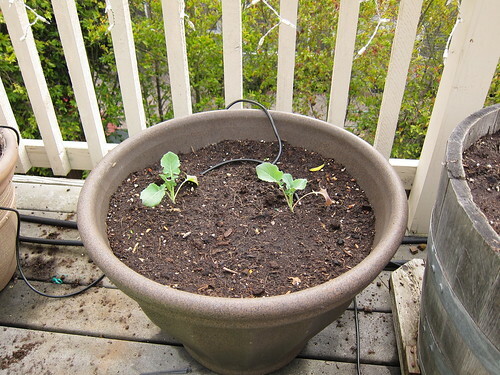 See, we bought a 6-pack of broccoli, so the plants are spaced out in a few different pots. I think also in this photo may be some cauliflower. This one in the front is definitely cauliflower. And who knows what’s in that pot in the upper right. But you get the idea. And last but not least we have shallots! This is another one that Jason picked out. We’ve never planted these before so it’s an experiment. They are bulbs… they look just like the shallots you’d buy at the grocery store. They are planted with just the tips peeking out (as per the instructions). Supposedly multiple shallot bulbs will form surrounding each of the starter bulbs. So that’s it for now. 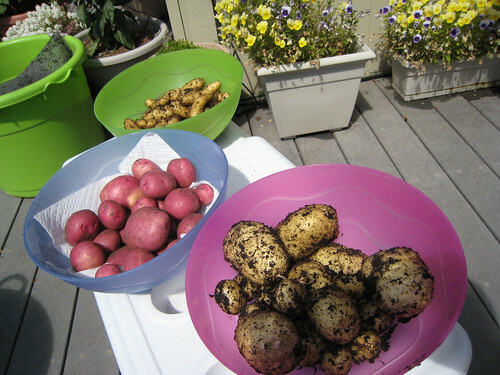 We did buy some red, yellow, and russet seed potatoes… but those we will put in the ground a week or two from now. 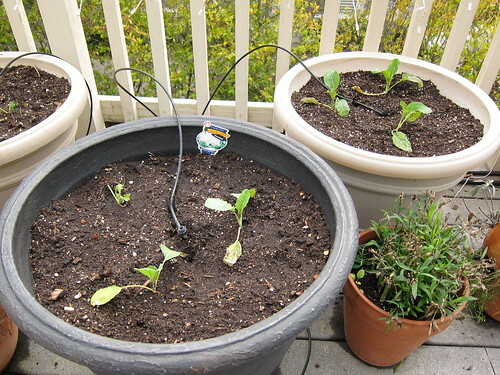 We also ordered some seeds for tomatoes, peppers, cucumbers, squash, melons, etc… and will be starting those indoors in the garage with artificial lights. Oh I should also mention that we used our own homemade compost for the first time! Last spring we started a compost bin in a large black trash can with lots of holes poked in the sides. We added plant trimmings, food scraps and shredded newspaper… watered the mix occasionally, and stirred it with a pitch fork. We just kept adding stuff through the summer until the bin was full… and magically it turned into rich black compost. Normally we would buy this stuff in bags at the nursery… so it was pretty great to be able to turn our own garbage into compost! We mixed some into each of the pots to add nutrients back to the old potting soil. Stay tuned this spring for further garden progress photos! Something about fall always makes me want to cook. Especially comfort food. Header photo taken by Kathy Froilan. All other images © spoons & spades.